Precious Knowledge demonstrates what forces are unleashed when education challenges the state, and students determine their own curriculum. The remarkable film Precious Knowledge recounts the stories of the students and teachers who comprise the Raza Studies Program, a series of courses which focus on Mexican and Chicano history, and which serves the largely Chicano student body of the Tucson, AZ public school district. The film, which was originally intended to be an exposition of the program and its classes, became a platform for protest when, in 2010, Ethnic Studies were officially banned in the state of Arizona, and the Raza Studies Program in particular came under attack from the state’s superintendent and countless other government officials. Precious Knowledge, which is still in production at Dos Vatos, shrewdly unveils the state’s serious discomfort with providing spaces for learning which empower brown, native, immigrant, poor and working communities, and disarms the charges of sedition and treason which are usually leveled at radical politics and education. More importantly, it documents the lives of an incredibly fierce collective of students and their families as they struggle, with the guidance of their wise and devoted teachers, for the right to their own radical heritage, and their ability to share and pass it on. While the film has not yet been released, it is touring in small screenings, and will hopefully be available for public viewing in the next year. 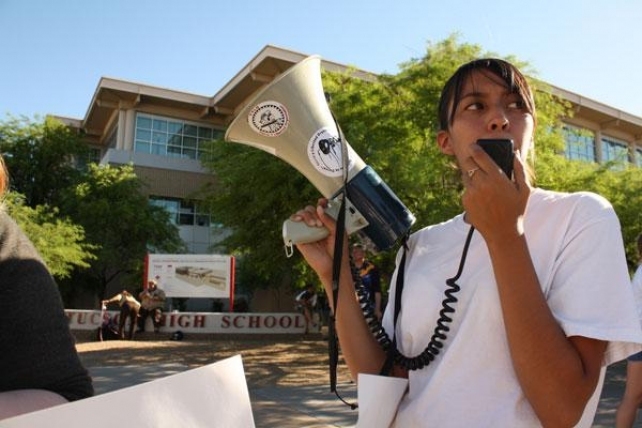 This film is an incredible inspiration, not only in the ongoing battle for Ethnic Studies, but as a reminder that the sometimes tricky field of public education can serve radical purposes–ones which pose a genuine threat to the state which funds it–when is directed by the right hands, and when students are given the voice and power to shape it. Keep your eyes out for any screenings near you, and support Dos Vatos and their other amazing productions.